Worried about ice melting and BPA leaching into your water bottle? It's time to go insulated. Insulated water bottles can keep your beverage cold and you hydrated while you worry about the finer things in life. Choosing which one suits you, on the other hand, can present a bit of a conundrum. Should you go with a trusted brand like YETI or opt for an eye-popping design like S'well. The truth is, it depends on your needs. To make things easier, we took five of the most popular insulated bottle brands available on the market and broke them down to make your purchasing decisions a breeze. Take a look at how these five insulated water bottles compare. As a side note, many of these bottles come in varying sizes. However, to keep the price comparison on point, we kept the size variation as close as possible for you to figure out which of these best insulated water bottles is right for you. Enjoy! These eye-catching stainless steel water bottles have a sleek design beckoning you to stay hydrated. Just check out this sweet teakwood water bottle. If that's not your thing, they also come in a variety of colors and feature other fun designs. Their insulation includes a copper layer, promoting 24 hours of cold drinks with 12 hours of hot. Slim like a plastic water bottle, these fit in standard cup holders making them good for the day to day life of running around doing errands or adding some fun flair to the office. If you're worried about adding ice cubes to your cold water, the opening is wide enough to pack it tight. Get it for $35 with Amazon Prime plus free shipping. What makes the Camelbak Eddy stand out from the other insulated water bottles on the market is its unique flippable bite valve. With the flip of a single finger, you can bite and sip on the sports water bottle style top while holding onto the convenient cap loop. If you're the type to forget to screw a lid on tight after a sip, you may want to consider this hydration method. It's also good for outdoor activities like cycling which limit you to a single hand. Along with the lid, Eddy is built with a double-walled vacuum insulation out of pure stainless steel. The double wall vacuum keeps your water cold for the entire ride. It also comes with a lifetime guarantee. Get it for $22 with Amazon Prime plus free shipping. 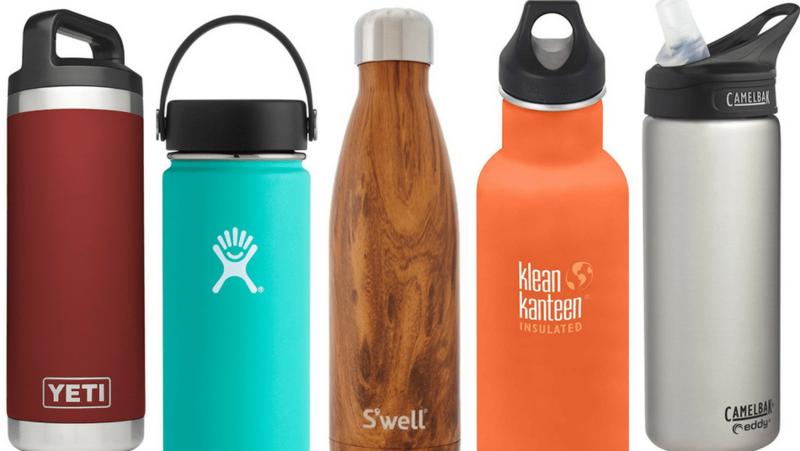 When water bottles like Nalgene were dominating the market, Klean Kanteen came in and gave us a reason to ditch the plastic and go with stainless steel. In 2004 they introduced the first stainless steel, BPA-free, reusable water bottle and sparked a revolution. Their insulated stainless steel Klean Kanteen Classic is highly impressive, boasting up to 50 hours of cold beverage and 20 hours for hot drinks. Available in a variety of colors, there's no need to worry about the exterior chipping or scratching. Their high-quality safe powder coating is chip and scratch resistant. And the leak-proof loop cap lets you rest assured your precious ice-cold water, or beer, we're not judging, doesn't accidentally seep out of the container. Get it for $31 with Amazon Prime plus free shipping. I've had my YETI Rambler for about two years now and I would be lost without it. Like all their products, this thing was built to last. Durable and reliable, it's sweat proof design kitchen-grade stainless steel bottle is rust-resistant and virtually impossible to puncture. Its topped with an insulated, leakproof TripleHaul Cap for easy carrying. The wide mouth feature is also nice for when it's filled with coffee or tea. I find the Rambler is ideal for an active lifestyle. Hiking, kayaking, running errands, or whatever you're getting into, you can strap it on a pack and take it with you. Or simply grab and go. Get it for $30 with Amazon Prime plus free shipping. Durable, well insulated, and built for easy drinking, the Hydro Flask vacuum insulated water bottle is best to suit all your needs. Take it with you on an outdoor adventure or stay hydrated at work. This thing is built for you. Thanks to the wide mouth you can easily stuff it with ice cubes and sip at your leisure. The body is made out of food-grade stainless steel and sports a BPA-free, phthalate-free plastic cap. The double-walled, vacuum insulated TempShield Insulation will keep your drinks cold for up to 24 hours or hot for 12 hours. You can also customize it to your liking on their website with their options of 7 sizes, 2 lids types, 4 parts, and 14 different colors. With options like that, you're hard pressed not to find a design that suits your liking.